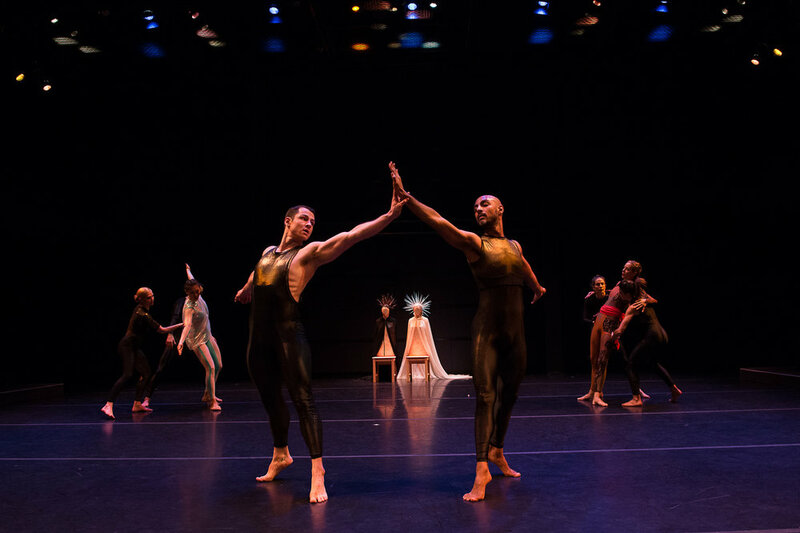 Tandem, a new sixty-minute dance by Guggenheim and Bessie award winner Douglas Dunn, imagines a wide space. As if the viewer is looking out over a savannah: things are happening over to the left; things are happening over to the right; things are happening right in the middle. A group of eight young dancers, along with an older solo figure, fill, alter, and empty the space. The variables are density, shape, rhythm and tempo. The balance of dance and dancer allows suggestive imagery to emerge. In not telling the viewer what to think or what to feel, the dance emulates nature’s unaccountable presence. Secret of the Waterfall (1983). 35 years after it was filmed on location in Martha's Vineyard, Secrets of the Waterfall, created by Douglas Dunn and video artist Charlie Atlas, will be presented in a rare screening at the Chilmark Public Library. Anne Waldman, Reed Bye, and the 1983 Douglas Dunn dancers are all featured in this dance film. Join us for a post-show discussion with choreographer Douglas Dunn after the film! Secrets of the Waterfall was originally commissioned and produced by WGBH Boston, and is brought to you today in collaboration between the Chilmark Public Library and The Yard. Douglas Dunn + Dancers is a Modern Dance Company with a forty-year history dedicated to creating and performing original work by Douglas Dunn, nurturing the careers of young artists, and stimulating the imagination of diverse international audiences. With touring around the globe, the company also presents annual seasons in NYC, and regularly offers workshops and classes. Douglas Dunn has been dancing and making dances for forty-five years. While dancing with Merce Cunningham (1969-1973) he also worked with Yvonne Rainer, leading to the founding of Grand Union, the daring, no-rehearsal collective. Dunn showed solo and duet work beginning in 1971, and formed Douglas Dunn + Dancers in 1978. He likes to collaborate with poets, painters, sculptors, musicians, composers and playwrights, offering a multifaceted theatrical experience. He sets pieces for companies besides his own, including the Paris Opera Ballet. Renowned as a teacher of Technique and of Open Structures, Dunn has had a long tenure at NYU's Steinhardt School of Culture, Education, and Human Development. Awards include a Guggenheim, a Bessie, and Chevalier in the Ordres des Arts et des Lettres. He receives fellowships from the National Endowment for the Arts, the New York State Council on the Arts, the Department of Cultural Affairs, the John Simon Guggenheim Memorial Foundation, the New York Foundation for the Arts, the Lila Wallace-Reader's Digest Fund, the Foundation for Contemporary Performance Arts, and the Creative Arts Public Service Program, among others. Dunn produces Salons at his studio in Soho, and is Board Member Emeritus of Danspace Project/St. Mark's Church since 2005. His collected writing, Dancer Out of Sight, is available at Amazon.com.